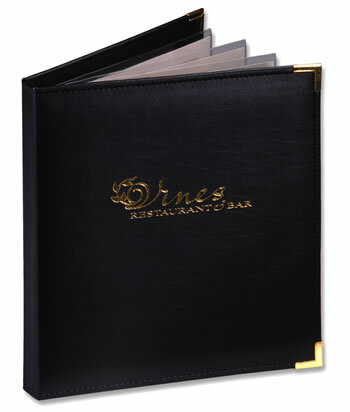 Terrific for your larger menus as well as your wine & liquor lists. Casebound, heavy duty cover, reinforced, soft leather like material with grain. You may wish to purchase optional page protectors, shown at the bottom of this page. 12-page capacity for 24 views, black interior. Stitched edges. Smooth gold corners standard; silver upon request. Custom imprinting available. Please click to the thumbnail to the left to view enlargements and colors. • View a super high-resolution image of the Captain's Book right now! See all the great swatches, too. 12 Page Capacity for 24 Views. Stock Number Description - For insert size..
PP-5585 Clear 5-1/2" x 8-1/2" vinyl page protectors for use in Captain's Books. Each Captain's Book will hold up to 12 protectors for 24 viewing sides. These high-quality, long-lasting page protectors are indicated for Captain's Books, Three Screw Post Menu Cover Binders, or Three Ring Menu Cover Binders. PP-42511 Clear 4-1/4" x 11" vinyl page protectors for use in Captain's Books. PP-42514 Clear 4-1/4" x 14" vinyl page protectors for use in Captain's Books. PP-8511 Clear 8-1/2" x 11" vinyl page protectors for use in Captain's Books. PP-8514 Clear 8-1/2" x 14" vinyl page protectors for use in Captain's Books.